Researchers in the US have created a new system for monitoring structural damage in real time. Based on a carbon nanotube composite, the system uses thermal imaging to reveal areas of unsafe cracks and stresses. Damage detection systems are already used in some civil structures and aircraft. In helicopters, for instance, systems monitor the vibration of gearboxes and bearings to spot dangerous behaviour before anything fails. Other systems use strain gauges with computer models to predict when structures are close to fracture. One upcoming method to spot damage is thermography. Here, a structure is heated and simultaneously monitored with an infrared camera. The transmitted heat is forced to detour and concentrate around areas where the structure is stressed, or where small cracks are developing, and these patterns reveal themselves on camera. But existing thermography techniques all require a heating element that is separate to the structure itself, and this baggage prevents the systems from being used in real time. 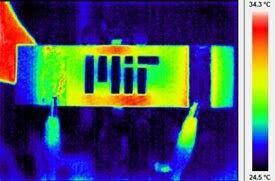 Brian Wardle, with colleagues at the Massachusetts Institute of Technology in Cambridge, have got around this problem using a thermographic system that contains its own means of heating: a composite of carbon nanotubes. The composite can be incorporated into a structure, and heats up once a voltage is applied across both ends. 'The temperature is able to penetrate much deeper into parts than an external supply, and the heaters and sensors are actually structural and improve mechanical properties,' says Seth Kessler, who heads Metis Design, a consultation firm also based in Cambridge that is furthering the design. Wardle's group made the composites by growing nanotubes on alumina fibres that had been woven into a cloth, and then surrounding them with epoxy resin. In a test, they drilled a hole into the centre of a long piece of the composite and then, while applying power of two watts, applied tension to either end of the sample until it broke. Using an infrared camera, the researchers were able to see 'hot regions' around the hole where stresses concentrated, and finally a bright crack appear just before the sample failed completely. 'Because of the [short] length scale of these nanofibers, there is an inherent advantage in using them for this purpose because the defects are often relatively small compared to the component we are inspecting,' says Douglas Adams, mechanical engineer at Purdue University in Illinois, US.